Elements Applied: The rootstock is commonly applied in herbal medicine. Active Components: Butcher’s broom medical capacity originates from steroidal agents, namely, neuruscogenin and ruscogenin. Acting identically to diosgenin, which can be found in wild yam, ruscogenins inhibit permeability of vascular walls, acting as a remedy for inflammations. 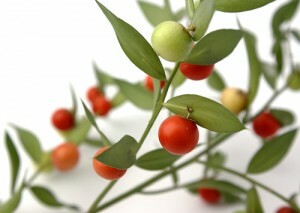 Butcher’s broom can also lead to constriction of smaller veins. According to recent pharmaceutical researches, the herb is really potent as far as its vasoconstrictive ability is concerned. Saponins, which can also be found in it, shrink capillaries, due to which fact Butcher’s broom is applied for hemorrhoids and varicose veins. History: Butcher’s broom bears its name from its historical usage as a broom. As it was characteristically employed as a broom by butchers, it was named so with this respect. Twigs were occasionally taken as meals. In the ancient times this plant was applied for urinary conditions, as it was believed to possess diuretic properties. In the Mediterranean regions the herb was applied for a wide range of inflammatory and circulatory conditions. Pliny, a Roman herbalist, stated it was used for varicose veins before Christ. In Ancient Greece the remedy was applied for swellings. Used For: The range of conditions Butcher’s broom is applied in includes: varicose veins, hemorrhoids, recurrent venous insufficiency, and atherosclerosis. Butcher’s broom is completely safe for one’s health if taken according to directions. It is commonly utilized to induce vessel constriction and treat inflammations. Hemorrhoids and varicose veins are also relieved using the herb. According to scientific studies, the herb is quite efficient when used for treating recurrent phlebopathy in the lower joints, and varicose veins treatment. The study employed butcher’s broom extract to see the results. Additional Info: Butcher’s broom is an evergreen shrub indigenous to the northwestern areas of Europe and the Mediterranean countries. It belongs to the lily family and is common with asparagus in its characteristics. Young twigs and roots of the plant are applied in herbal medicine. Preparation and Intake: Suppositories and ointments which contain butcher’s broom are commonly applied for hemorrhoids. They are usually employed before night sleep. Butcher’s broom powder extract is produced in capsules and intended for recurrent vein insufficiency at a dose of 1000 mg thrice a day. For this aim the herb is commonly used in conjunction with flavonoids or vitamin C.
As a substitute, one can use a standardized extract, and use ruscogenins at a dose of 50-100 mg a day. To prepare a home remedy, take two teaspoons of powder extract for one and a half pint of water, boil it up and simmer under a cover for nearly 30 minutes. Let the result cool down on its own under the cover. Taken cold, in a quantity of 2-3 tablespoons six times per day. Safety: No adverse effects are reported if the remedy is taken according to directions mentioned above.